Thanks to all participants this year! Ribbons are available at the Chamber office. Meet us on Sutton Rd. 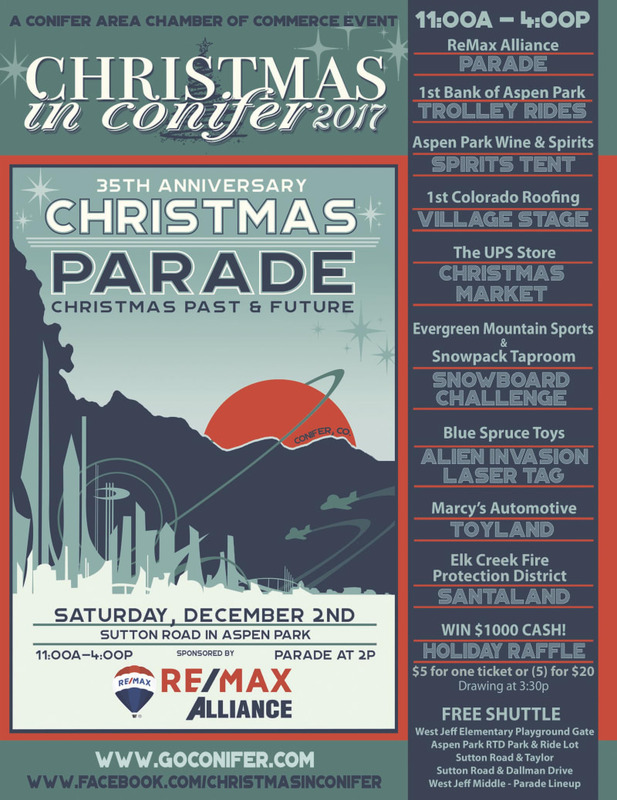 on Saturday December 7, 2019 for our 37th Annual Conifer Christmas Parade sponsored by RE/MAX Alliance. The Theme for the 2019 parade will be announced in September 2019. 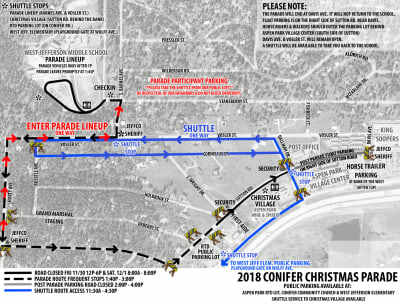 Join us on Saturday, December 1st for the 36th Annual Conifer Christmas Parade featuring Candy Land theme. Don’t miss holiday trolleys, warm spirits, live entertainment, Christmas Markets, Santaland and of course the very best small town Christmas Parade at this year’s 36th Annual Christmas in Conifer celebration! 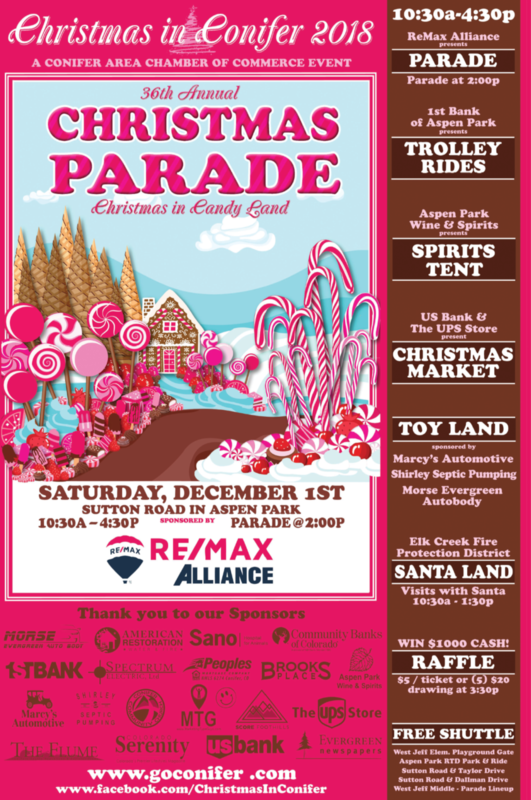 This year’s event, sponsored by ReMAX Alliance, kicks off at 10:30a on Sutton Road in Aspen Park. Public parking is available at West Jefferson Elementary, Aspen Park RTD Lot and Conifer Community Church. A free shuttle is available. Check www.goconifer.com and www.facebook.com/ChristmasInConifer for shuttle information. Embracing the Candy Land theme, this year’s celebration boasts new amenities including a velcro wall, combination bounce house, Lemon Candy Cane hop and piñatas filled with candy. Parade veterans won’t be disappointed as signature classics including the Holiday Trolley sponsored by FirstBank and warm spirits at the Christmas Spirits Tent sponsored by Aspen Park Wine & Spirits. Make sure to come prepared to shop at the Christmas Market featuring over twenty local crafters and vendors, sponsored by The UPS Store and US Bank. Several food trucks will be available to tempt the palette of parade goers and offer a wide selections of festive treats. Elk Creek Fire Protection District will also be onsite all day to offer their annual Santaland boasting warm fires, pictures with Santa and the Mrs. as well as yummy treats and fun games. Santa visits 10:30a - 1:30p. The parade kicks off at 2p and features floats, marching bands, fire trucks and animals. This year the parade will end at Davis Drive just short of King Soopers with post parade parking along the South side of Sutton Road. $1000 Holiday Raffle will be held at 3:30p on the Christmas Village stage. Tickets are $5 each and (5) for $20 and can be purchased by the traveling elves on the Citywide Spirit Cart parade day. Proceeds help support future Christmas in Conifer celebrations. Parade Awards will occur immediately following the raffle. Interested in joining in the festivities? We welcome parade entries, vendors and volunteers. Applications are available on www.goconifer.com. Applications are currently be accepted for 2019! If you are interested in playing at this event, please CLICK HERE and fill out the application. Vendor application will be available shortly. CLICK HERE to be added to the vendor distribution list and you will be notified when the application is live.